Let Small Business Saturday be your inspiration for weeks of shopping local. 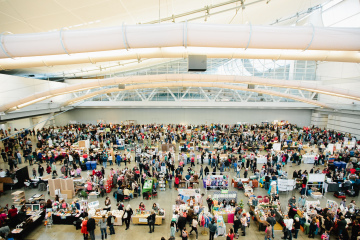 In Pittsburgh, there are events all season long that give you the opportunity to support local businesses and makers — from traditional holiday markets to specialty pop-ups to special store access — plus plenty of spots that bolster local artisans year-round. Here’s a sampling of the many ways you can boost the Burgh with your dollars this year. After stuffing yourself with turkey on Thursday, check out this Hill District boutique over the long weekend. There you’ll find local and global fair trade goods along with free and low-cost artsy activities, including a personalized 3D-printed Egyptian cartouche. (Make sure to reserve your spot in line for that one.) Bring the kiddos along for the magnet making activity that’s free for all ages. 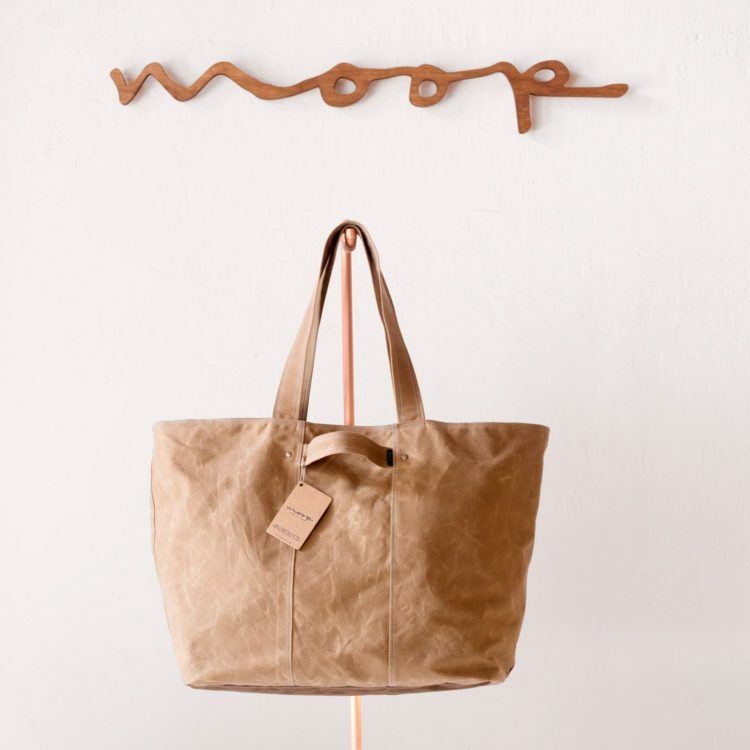 Weekender bag from Moop. Photo courtesy of Moop. A pop-up just for the holidays that brings some of Pittsburgh’s top Lawrenceville shops Downtown. Toll Gate Revival, Vestis and Pavement are three of Lawrenceville’s top clothing boutiques, and you can find their fashions here without braving Butler Street traffic. Joining them is Moop, which creates unique canvas bags, and manufactures them in Downtown Pittsburgh. Inspired by the Christmas Markets that bring convivial cheer to the centers of German cities, this cluster of Alpine-style chalets has become as much a fixture of a Pittsburgh Christmas as the Spirits of Giving from Around the World at PPG Place next door. The Holiday Market features distinctive gifts, decorations and treats, made in Pittsburgh, Germany, Poland and many points in between. Uptown Sweats by Kiya Tomlin. Photo courtesy of Uptown Sweats. Trusst Lingerie‘s storefront in Garfield becomes a pop-up store featuring work from local women designers. 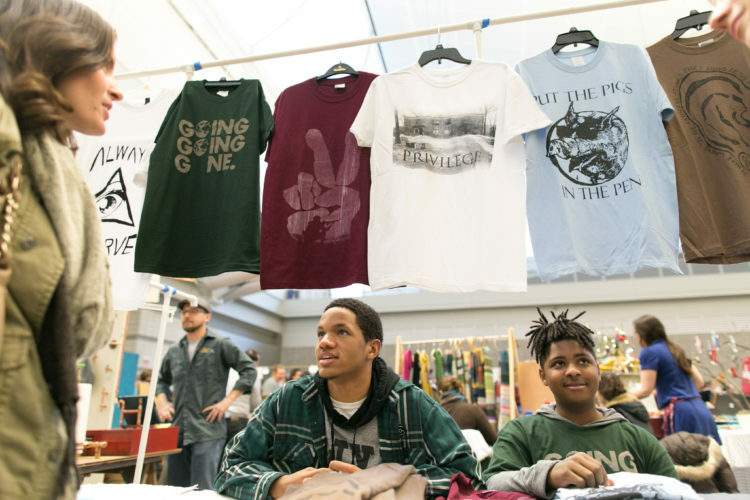 You’ll find designs by Kiya Tomlin of Uptown Sweats (stylish fleece sweatshirts), Nisha Blackwell of Knotzland (bow ties), Gillian Preston of Broken Plates (handmade glass jewelry), Shannon Pultz of Blak Rust (silk scarves) and Sophia Berman of Trusst Lingerie. Just about every local museum is celebrating the first-ever Museum Store Sunday with special events and sales. For instance, Carnegie Museum of Natural History debuts a new line of T. Rex merchandise — ranging from posters to jewelry — inspired by Jane, the T. Rex in the center of the store. There will be a live violin quartet and an appearance by the 10-foot-tall, life-like Anzue wyliei puppet. No admission necessary. 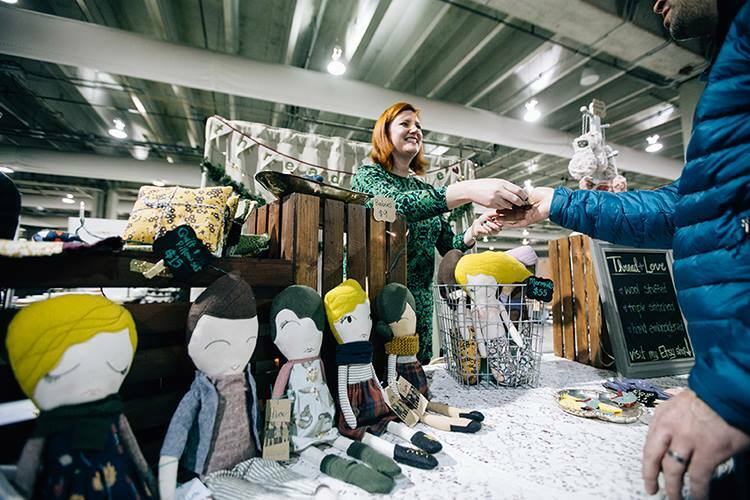 This will be a bonanza featuring local artists, crafters, designers and makers selling handmade home goods, kids’ clothing, ceramics, bath and body supplies and artwork of all kinds. Vendors you’ll find include Joe Ireland Photography, Dragonfly Lake Scents The Foxglove Hollow, Wit & Purl, Homestead Luminary, The Circle Craft and more. 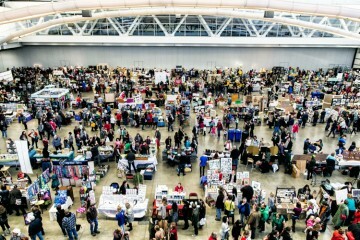 With 170 vendors, Handmade Arcade’s largest event yet features a gigantic selection of crafty gifts from do-it-yourselfers of every stripe, local to national: organic skincare products, bowties made from recycled fabric, contemporary photography, creepy plush dolls, glass jewelry, metalwork, even candles that smell like beer. Plus, Handmade Arcade always features local DJs and lots of free hands-on craft, art and tech activities with local artists and arts organizations, for kids and adults. Pittsburgh airport shopping has been transformed in the past few years, adding new and better stores and restaurants. On December 2 it will be open to everyone (even if you’re not flying anywhere), with music and an appearance by Santa. Stores are open until 7 p.m., with food and drink until 7:30 p.m.
Penn + Fairmount line from Pittsburgh Glass Center. Photo from Pittsburgh Glass Center. Dec 1, 6 – 9 p.m.
Dec. 2 & 3, 10 a.m. – 4 p.m. 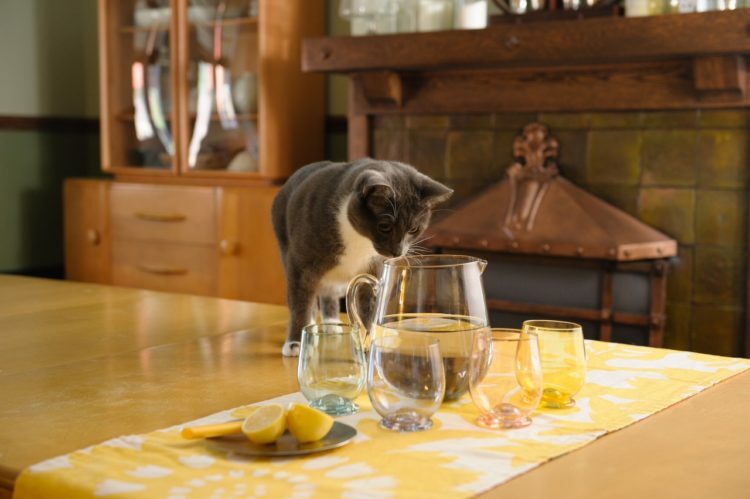 Here you’ll find handmade glass from regional artists like the Penn + Fairmount‘s Jason Forck Collection of pitchers and tableware, created here using traditional Venetian glassmaking techniques (and currently featured in Martha Stewart Living magazine). 11 a.m. – 7 p.m. Mon. – Fri.; 11 a.m. – 5 p.m. Sat. – Sun. When you can boast 100 local artists and more than 5,000 items for sale, you know you’ve got a big thing going. Here you’ll find handcrafted jewelry, knitwear, ornaments, food, glass, ceramics, fine art and plenty more, including many budget-friendly items. 11 a.m.-2 p.m. and 4pm-7 p.m.
LUXE Creative turns the Hotel Monaco into a Winter Wonderland, with handmade glassware, leather goods, clothing and more from Pittsburgh makers. Sandwiches and apple cider will be supplied by The Commoner. Last-minute shopping for handmade and vintage gifts from Boheme Pittsburgh, plus Spirit’s first-rate pizza. That’s an awesome combo any day. Purchase a one-of-a-kind artwork for someone you care about this holiday season. The [email protected] represents more than 200 local artists, ranging from print to sculpture to glass to ceramics. Looking to support local brick and mortars? Turn the page to check out shops that feature local makers all year round.